Crock pots are a live saver in the kitchen! In this day and age with our families being busier than ever, it is often hard to get a home cooked meal on the table. When using a crock pot, delicious meals practically make themselves, allowing us to move on to other tasks or come home to a ready to eat dinner. With crock pot cooking, food has the time it needs to reach perfect flavors and consistency. They offer a wonderful alternative to eating out, grabbing fast food, or heating up frozen foods. If you are looking to jump on the crock pot bandwagon or to upgrade your existing crock pot, there are some basic things to consider. Crock pots come in a varied range of functions and prices so you’ll need to think about what is most important for how you plan on using it. Crock pot material- pots come in ceramic, porcelain and metal. They are all great at conducting heat, so this depends on your preference. Ensure that the pot is removable to make for easy cleaning! Size- crock pots come in all sizes so you will want to consider the number of people you are typically preparing meals for. If you are a smaller household and don’t have the need for leftovers, a 3 quart or 4 quart should work nicely. 6 quart pots are average size and sufficient for most families up to 6-8 people, but if like preparing larger batches of food, you may consider going even larger. Warming settings- crock pots have high and low settings, but some also have a warming function which will keep foods warm after cooking until you are ready to eat. Timer- this is a great feature to have if you don’t plan on being home for the entire time the meal is cooking. Timers usually have a few preset options and will prevent the food from becoming overcooked. Sear function- some slow cookers offer a searing function that allows you to sauté veggies or brown meats. You can use this function before adding other ingredients to the pot and make it a true 1 pot meal with less clean up. There are many new upgraded crock pots to consider for every budget. Whether you’re looking for cool features or great color schemes, one of these models is sure to fit your needs. 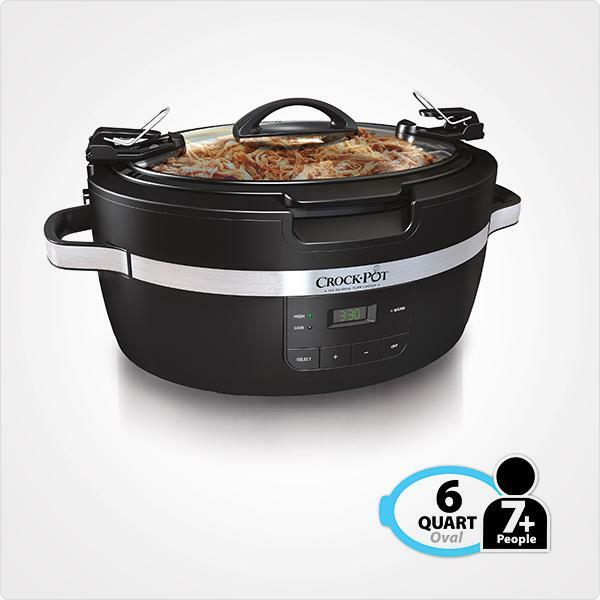 Check out the current Top 10 crock pots on the market! This oval-shaped slow cooker is made by the original Crock-Pot brand and feautres a 20-hour digital countdown timer. Its roomy interior allows a meal to be cooked for 8 people and can accommodate a 7lb roast. This crock pot is convenient for traveling, tailgating, family gatherings, parties and just about anywhere you need to travel or cook hot food on the go! Its interior capacity allows it to serve 7 plus people and comes at a great price point. This 7 quart crock pot is roomy enough to serve 8+ people. It offers programmable times ranging from 30 minutes to 18 hours and low or high heat settings. There’s no need to monitor the cooking process as the wraparound element provides even heating and a countdown timer lets you keep track of when dinner will be ready. The 6-qt Hamilton Beach Set & Forget Programmable Slow Cooker has three choices for automatic cooking, and makes a busy weeknight easier than ever. Three smart settings – probe, program and manual – allow you to cook foods to a specific temperature, for a set number of hours or on High, Low or Warm settings for up to 24 hrs. Advanced features like a temperature display and probe minimizes the chances of overcooking your food. The Crock-Pot 3.5-Quart Casserole Crock Slow Cooker is perfect for the smaller family dinners, feeding 3+ people. The Casserole Crock is versatile that you can use it either by plugging it in on the countertop or by placing just the stoneware in a conventional oven. Easily portable, the Casserole Crock uses the Cook & Carry locking lid system for easy transport, without spills or mess. 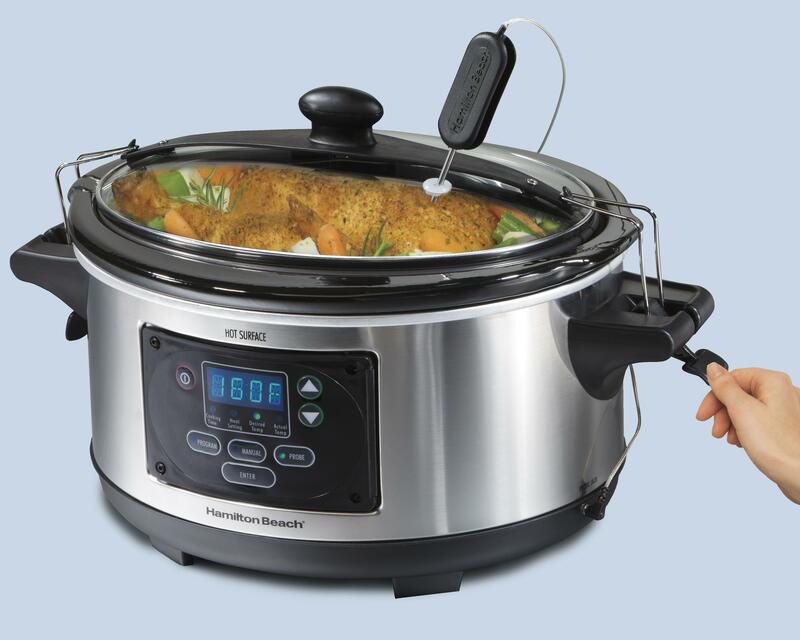 Eliminate the need for pots and pans with The Crock-Pot 3-in-1 Multi-Cooker. This model lets you brown/sauté, slow cook, bake, and keep warm using just one appliance. It has 6-qt capacity and easy to read digital control panel that allows you to adjust temperature and cook time to your schedule. The ThermoShield Cook and Carry Slow Cooker lets you enjoy the same convenience and power of regular slow cookers, minus the hot exterior that can burn hands if accidently touched. The insulated design works to better retain heat on the inside so your food comes out tender and ready to eat. It has an easy to use digital control panel to customize your cooking experience. 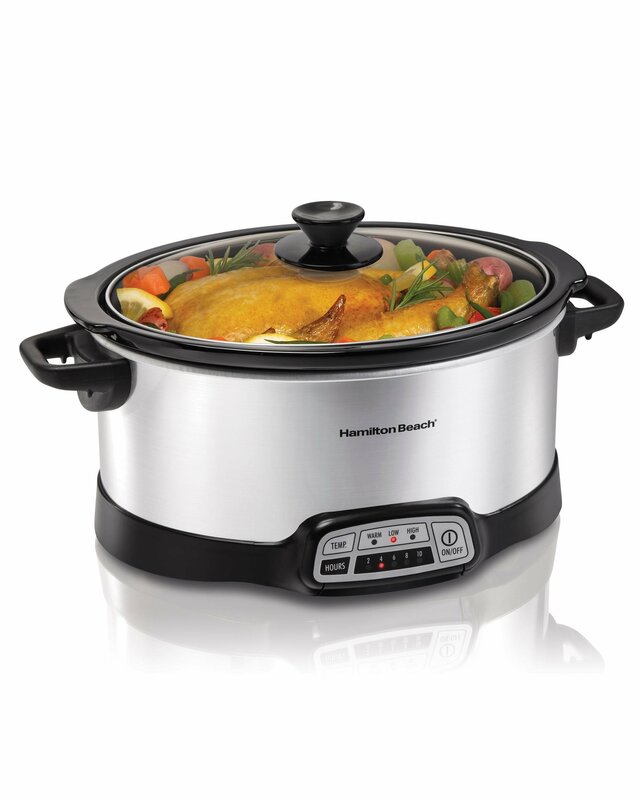 The Hamilton Beach 10 Quart Slow Cooker’s extra-large capacity is perfect for everything from game-day chili to your holiday pot roast. The oval shaped stoneware crock can fit up to a 10 lb. turkey or 12 lb. roast. This slow cooker features low and high cook settings and a warm setting and full-grip handles that make it easy to carry. Dishwasher safe for easy cleanup. The 6 Quart Slow Cooker sports three different temperatures settings that will allow you to set your ingredients and forget it. You can also easily set your cooking time from 1 to 10 hours and then it automatically swithces to its warm setting, ensuring it’s ready when you are. The 6 qt capacity feeds 7+ people. The BLACK+DECKER Portable Digital Slow Cooker with Full Chalkboard Wrap is a 7-quart stoneware pot with digital controls to set the perfect time and heat (low, high, warm). The unit automatically switches to ‘Warm’ mode when cooking is complete, so you’ll have a delicious meal ready for you when you are. The locking lid and large handles ensure easy transport and cleanup is simple with the dishwasher-safe stoneware pot and tempered glass lid. Additionally, the exterior is a chalkboard surface that lets you get creative with any info or designs you want to add!